Arising out of the Cleveland Artists Foundation’s Dialogue Series, a 22-hour-long collection of forums held in cultural institutions and broadcast on National Public Radio, Creative Essence examines regional culture through an exploration of the distinguished contributions Cleveland has made to the visual arts and architecture. The Dialogue Series brought together a variety of people in the visual arts community to discuss the development of the region’s creative life and environment, whether it be through architecture and city planning or through the industrial and fine arts. They shared their views and knowledge about how regionalism has long influenced artistic productivity. Their exchanges and ideas for the future are provocative and thoughtful. 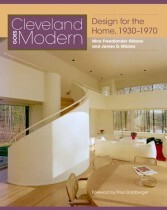 Richly illustrated with the work of well-known Cleveland-area artists and architects, past and present, Creative Essence explores the region’s tradition, beginning with the “Cleveland School” of artists that was active and influential during the first half of the twentieth century. It moves on to examine the changes that occurred in the last half of the century and the development of the visual arts in northeast Ohio. 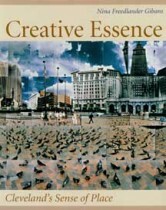 Creative Essence is an important resource for understanding the significant role the visual arts play in our cities and societies and how they contribute to the region’s quality of life. For those interested in regional history and for students of art history and the visual arts, this will be especially valuable. Nina Gibans is a lifelong resident of northeast Ohio. A recipient of the Cleveland Arts Prize, she has worked for cultural organizations in volunteer and professional capacities her entire career and has served on numerous civic and cultural boards of trustees. Her degree is in art history and aesthetics. This is her fourth book and fourth video program.